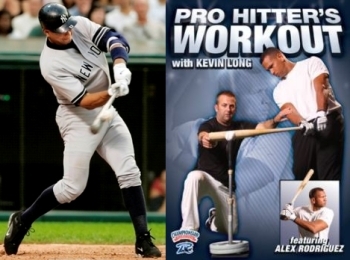 Although major league hitting instructors and hitting coordinators teach a variety of different things, perhaps the best description of what is most commonly taught is an A to C (or sometimes A to B) swing. It is also sometimes referred to as being short to, and long through, the baseball. The basic idea, which is correct, is that a swing has to be very short in order to hit a 95 MPH fastball. The problem is that hitters are taught that they must not allow their hands to take a circuitous route to the pitch. Instead, the hands have to take a direct, linear, A to C path to the ball and not a longer A to B to C path to the ball. 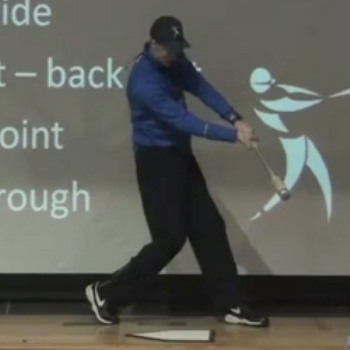 While this idea makes perfect sense, and as I also discuss in my piece Do As They Did..., the problem is that, if you compare how this swing is taught and demonstrated to an actual game swing, you will see some significant differences. If you go around the Internet, you can find numerous demonstrations of the A to C swing. This video clip pretty much sums up the idea and how to achieve it.1 You can also see the A to C swing at work in the clips below. Here's Joe Mather doing a pretty standard A to C swing drill. While the result of this swing was a ground ball, I assume the hope is that this will be a bomb in a game. 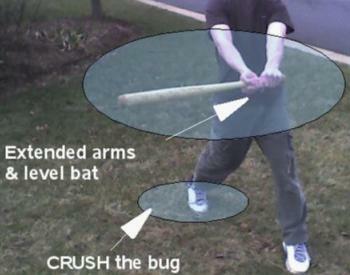 You can also see the same desired position at the Point Of Contact modeled in numerous still photos. The hands move directly to the ball. The bat chops down on the ball. The barrel stays above the hands through the POC (aka no "loop" in the swing). 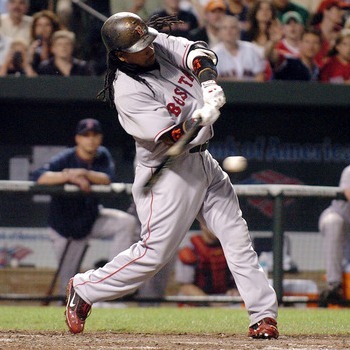 The barrel stays above the ball through the POC (aka not an uppercut swing). The hands are at the front hip. The front elbow is down. The bat is level to the ground. The barrel is lagging behind the hands. The back foot is squishing the bug. 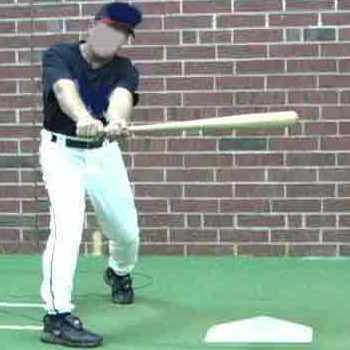 While the A to C swing makes logical sense, if you look at pictures and video clips of good hitters, you will quickly notice that there are some significant differences between what is demonstrated as a good position at the POC and how good hitters actually look at the POC. I discuss whether the barrel stays above the ball elsewhere, but you can see whether it's true or not by comparing the lists above to the pictures below. ...you will see some significant differences between the two positions at the POC. His hands are not at his front hip. Instead, his hands are out in front and midway between his back hip and his back shoulder. His arms are not extended. Instead, his back arm is bent 90 degrees. His front elbow is not down. Instead, it is up by his front shoulder. The barrel is not level to the ground. Instead, it's looping down below his hands. His wrists are not unbroken. Instead, they have unhinged almost completely. The barrel is not lagging behind the hands. Instead, the barrel is in line with his front arm. His back foot is not squishing the bug. Instead, he's up on the point of his back toe. As I discuss in greater detail in my piece on Albert Pujols' Swing, good hitters also get to this contact position quite differently than most people teach. Notice how, rather than keeping the barrel above his hands and swinging down on the ball, Albert Pujols lets the barrel fall below his hands and then hits the ball with a slight uppercut. 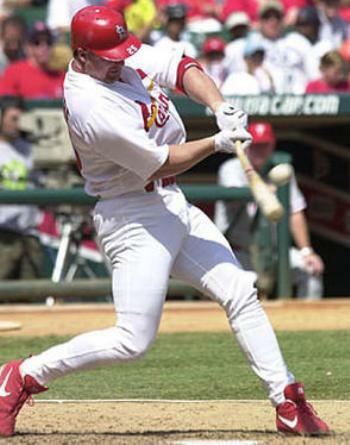 What you see in Albert Pujols' swing is what Don Mattingly, Tony Gwynn, and others call a loop in his swing (or a Reverse C in Tony Gwynn's terminology). Of course, if you take a close look at the swings Don Mattingly and Tony Gwynn, two of the biggest proponents of the A to C swing and two of the biggest haters of the loop in the swing, you can see loops (and uppercuts) in both of their swings. Don Mattingly's uppercut was particularly pronounced, since he tended to like the ball a bit lower than Tony Gwynn. Of course, Mattingly's uppercut was also appropriate since that is the only way to hit a ball down in the strike zone. In truth, neither Don Mattingly nor Tony Gwynn actually did much, if anything, that they currently teach. I have worked with Andres Torres for a number of years. He had an off year in 2011, and I wasn't sure why because I hadn't worked with him in depth since 2009. We met up in January of 2012 to try to get his swing back on track, and one thing that came up in our conversations was that, at some point after we met in 2009, Andres had been taught an A to C hand path, to keep the barrel above the ball, and to swing down on the ball. The result was that he had a hard time covering the bottom of the strike zone because he didn't know how to cover the bottom of the strike zone while keeping the barrel above the ball and swinging down on the ball. Of course, that's because you can't. That is why Don Mattingly didn't actually do what he teaches. Of course, the defining characteristic of an A to C swing is a linear hand path in which, in Don Mattingly's words, "The hands go directly to the baseball." 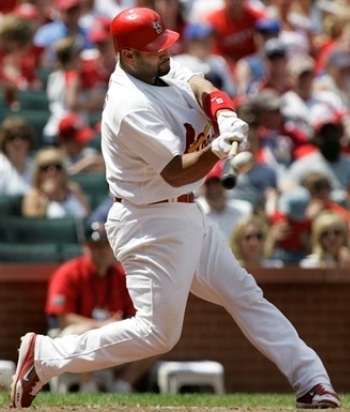 However, if you look at clips of hitters like Albert Pujols, you will see a hand path that is anything but linear. Instead, notice how Albert Pujols' hands start out on a gently curved path and then, a few frames before the Point Of Contact, take a hard left turn. That hard left turn is essential to getting the bat head to Whip out into the path of the ball and will not happen if you are trying to take your hands directly to the baseball. It never ceases to amaze me why people can see a drill produce nothing but ground balls in a drill but still believe those are going to be line drives and home runs in a game. It's more likely that, if you practice hitting ground balls, you are going to hit ground balls in a game. 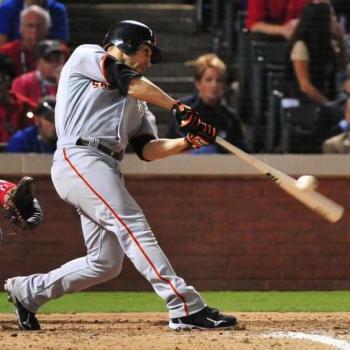 Finishing with the hands down at the front hip is actually a major flaw, commonly referred to as dropping the hands, that hurts hitters' ability to hit for both power and average.